It is finally spring which means it’s time for a weather theme! The weather is always changing and can be different from day to day in the spring. 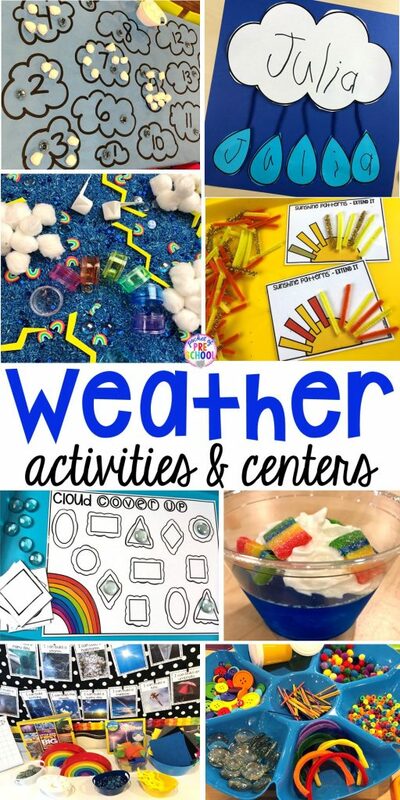 Grab your lesson plan book because I’m sharing all my favorite weather themed activities designed for preschool, pre-k, and kindergarten kiddos. There is even a Weather STEM FREEBIE later in this post so be sure to grab that. Sky Cup Snack! I mean how cute would this be for fun food Friday. Make blue Jello in clear cups for the sky then place whip cream on the top for clouds. Then sprinkle rainbow sour candies on top. Yum! Weather Books! On the bookshelf are tons of weather themed books about clouds, wind, sun, rain, storms, flying kites, water, and snow. My favorite weather book has got to be The Big Umbrella which is about accepting and making room for everyone! Cloud Writing! Fill a tray with shaving cream (use hair conditioner if you can’t use shaving cream) so students can write letters, numbers, shapes, sight words, or names in the clouds. It’s an easy way to make word work or handwriting FUN! Sprinkle in glitter and pretend it’s raining or snowing! Don’t want the mess? Put the shaving cream or hair conditioner in a baggie and students can write all the things on the baggie with no mess. Raindrop Letters and Sounds! Students match the uppercase, lowercase, and beginning sounds cards. If you want to make raindrop manipulatives, just write letters on the top of blue glass gems with a Sharpie marker. Rain Name Craft! My kiddos are loving name crafts right now plus they make a super cute bulletin board. Students cut out the cloud and the raindrops for some fun scissor skill work. Then students write their name on the cloud and individual letters on the raindrops. Rainbow Sight Words! Learning sight words can be fun with a rainbow twist. Students pick a sight word card and read the word, rainbow write it, and build it with the rainbow letter cards. If you have younger students have them read, write, build letters or student names. Weather Writing Table! Pack the writing table with weather themed word cards, stickers, tracing mats, and paper. Tornado Rhymes! Fill a tray with black beans to create the “tornado” and place half of the rhyme cards in it. Students pick a card and find the matching rhyme. Weather Sensory Bin! Fill the table with blue rice, blue sequins, and blue gems (raindrops). Add clouds (cotton balls), rainbows (mini erasers or rainbow pom poms), rain (blue glass gems), lightning (yellow foam cut in the shape of lightning bolts), small scoops, and rainbow pill jars (from Dollar Tree). Rainbow Play Dough Tray! This play dough tray is one of my favorites to date. Make or buy white play dough for clouds. Fill the tray with rainbow beads, rainbow buttons, rainbow pom poms, rainbow pipe cleaners, rainbow match sticks, and large glass gems. Students can sculpt and create rainbows so many different ways all while strengthing those little fine motor muscles. Cloud Count! Draw clouds on a large piece of butcher paper using India Ink in a bingo dauber or with a black marker. Students count out the corresponding number of cotton balls and place them on each cloud. Then match the cloud numbers. To make cloud number gems, use the large glass gems from the Dollar Tree and write a number on each with a Sharpie for students to match as well. This would be perfect for a morning table time activity. Cloud Shape Cover Up! To keep going with the cloud theme, play shape cloud cover up for small group. Weather Forecast Count! Students can pretend to be a meteorologist and create weather forecasts. Students pick a card and create the weather based on the forecast. If counting is too simple for your kiddos, have them pick two cards to add together and use the addition weather forecast math math (not pictured). Sunshine Patterns! Cut up some pipe cleaners and make sunshine patterns. Sometimes it’s the simplest activity that gets students excited. This activity is a perfect example of just that. Wind Blowing Painting! If you look closely you will see that students drew the wind by making curvy, swirly lines with a black Sharpie marker. Then they dropped liquid watercolor on the paper using a pipette (yep, more fine motor work). Last they used a straw to blow the paint just like the wind blows leaves. Rainbow Windsock! Windsocks are super easy to make. We had students paint a rainbow a piece of paper but you can have them just paint a fabulous design as well if you want it to be more open-ended. Once it’s dry glue or staple the sides of the paper together to make a cylinder shape. Tape a piece of string to the top for a handle. Students can cut crepe paper and glue it to the bottom. Now don’t forget to take them outside for students to observe how the wind blows! Weather Science! Make weather sensory bottles, create weather sorting cards, explore the capacity of different sized raindrops, and explore and create different kinds of clouds at the science table. Whooo! That was a ton of weather themed activities and I hope it helped you plan your weather theme! Love these weather centers? Pin this image!